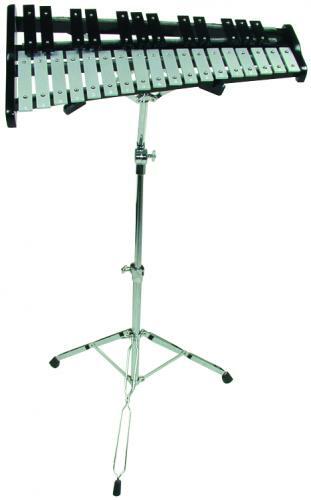 PERCUSSION KIT Complete with bag, practice pad, stand, mallets, sticks and music rack. 2.5 octaves, G5-C8 bells. 1" wide satin finish aluminum bars. Double-pin mounting over neoprene strips. 8" tunable pad. New heavy-duty stand. Heavy-duty basket assembly. Tilt feature. Bag dimensions: 25.5"L x 17.5" W (bass end) 13.5W (treble end) x 5.25"D Special order 2 weeks to ship.